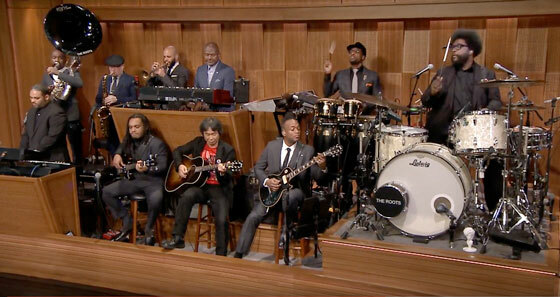 Whether they're taking guests out of their comfort zone or straight up impersonating them, Jimmy Fallon and the Roots know how to have fun with the musical portion of their show. Take last night's (December 7) program, for example, where the Roots lined up alongside Japanese videogame designer and producer Shigeru Miyamoto to play the classic theme from Super Mario Bros. In attendance to witness the unveiling of Nintendo's new Switch console on the show, Miyamoto picked up and acoustic guitar and seated himself among the band members to jam on the iconic piece of music. Fallon himself even came through to knock some coins out of a '?' block for good measure. Watch them play through the song in the player below.